When a family has no place to live after a hurricane; we think that’s wrong. We know the next hurricane or flood is one storm away. We believe the best way to resilient communities is having sustainable infrastructure. 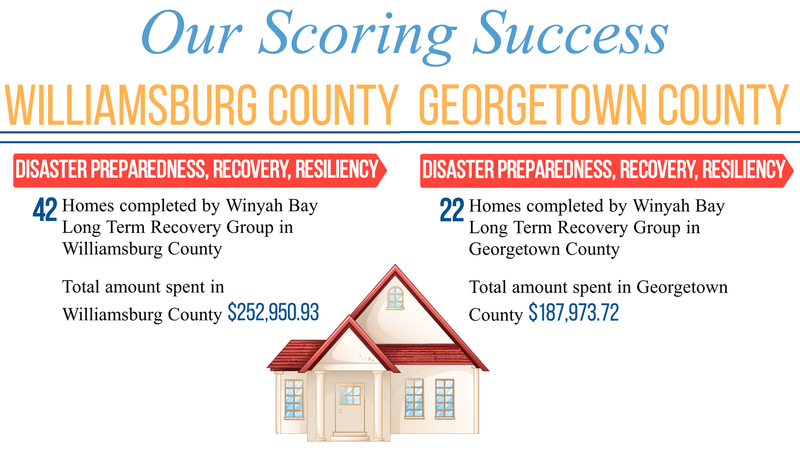 We are a South Carolina State partner for Georgetown and Williamsburg County for housing repair; which means we provide management and leadership for post disaster recovery efforts. SC Housing Trust Fund (SC-HTF) – delivers funds through established partnerships with other governmental entities, qualified non-profit sponsors and for-profit sponsors. SC HTF, as legislated, works through a network of Sponsors, including non-profit and governmental entities. These organizations apply for funding, and then use the funds to provide affordable housing to eligible citizens. Individual citizens who are looking for assistance through the SC HTF should contact Black River United Way, an approved sponsor. There are still so many more families in distress to help.